Experienced software developer, specialising in multi-platform Games and VR Applications. As a software developer with 10 years of programming experience, I have lead the technical development of many games, apps and websites on a range of different platforms. Proven experience of successful technical planning and the development of robust code architectures. Fluent in Agile development practices and effective at writing clear, detailed, technical documentation. Successfully shipped games and applications for a range of different platforms, including: iOS, Android, Web, VR, PC and Mac Desktop. With a varied portfolio of VR experiences, games, apps and websites, I've worked on projects for many clients including: Disney, Channel 4, British Museum, Wellcome Trust, Amplify, MyCognition, TAFE, PwC and the BBC. 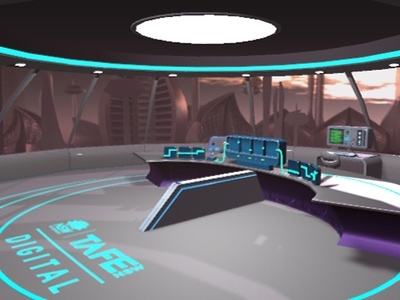 The PwC Teamwork Experience is a multi-user VR demonstration, designed to showcase how room scale VR can enhance traditional scripted training exercises. 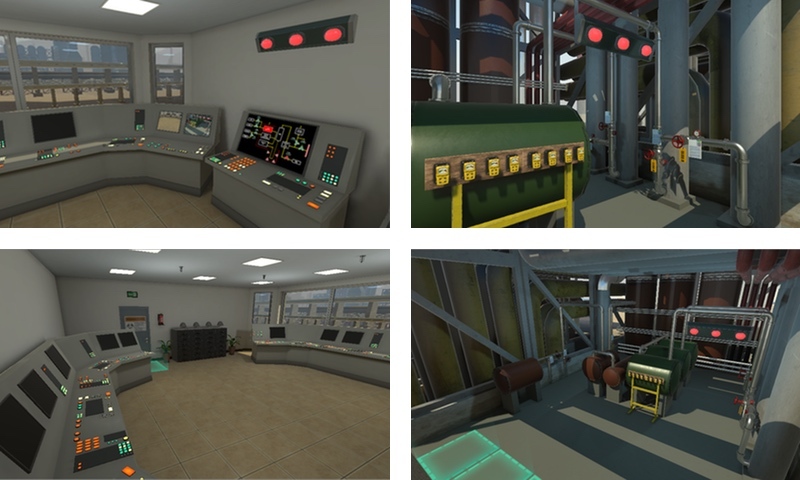 The application was built in Unity using the Immerse SDK and supports up to 5 simultaneous VR users, as they work together to resolve a series of critical system errors and emergency gas leaks in a fictional refinery. As the Unity Developer for the project, I was responsible for all programming tasks, while also repurposing assets from an existing project to create this new VR experience in under a month. 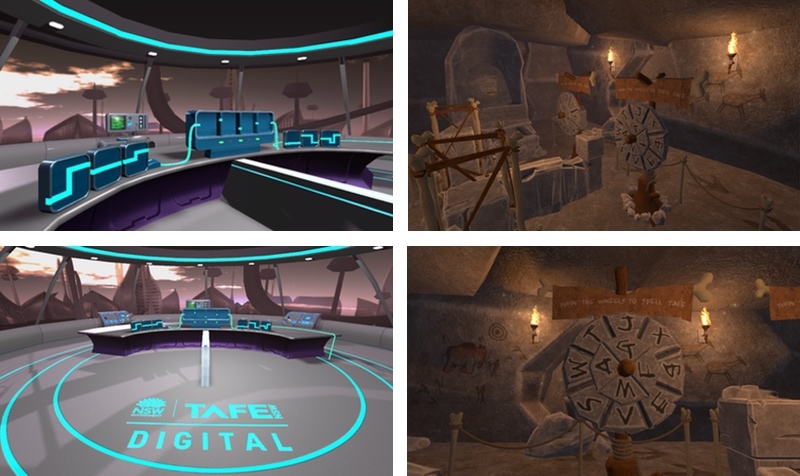 TAFE Digital HQ is a game-like VR experience for two players, created as the centrepiece for the official opening of the new TAFE Digital Headquarters in Armidale, Australia. 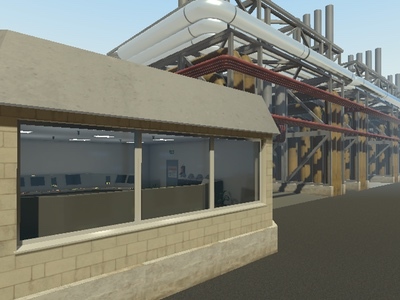 The application was built in Unity using the Immerse SDK and offers a fully synchronised multi-user room scale VR experience, where players complete a number of collaborative and competitive challenges in past and future settings. As the Unity Developer for the project, I was responsible for all programming tasks, while working with assets created by TAFE staff and students in Australia. With a short deadline to meet, the team collaborated across timezones to build the entire project from scratch in a single month. 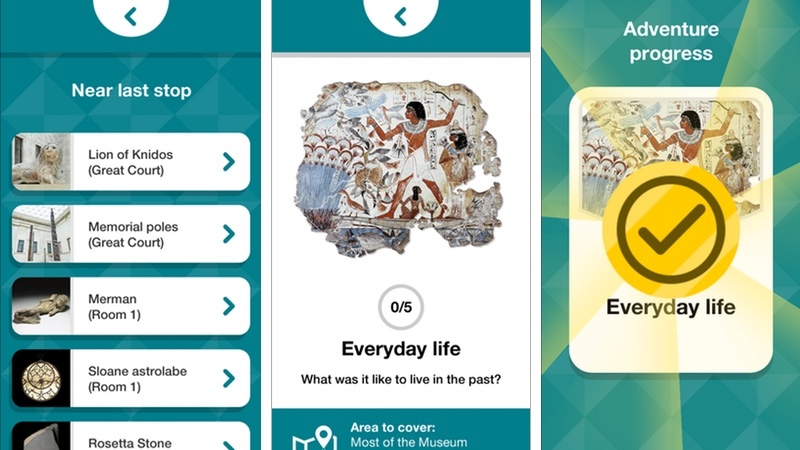 Adventure Cards is a fun and creative reimagining of the standard museum interactive guide format. 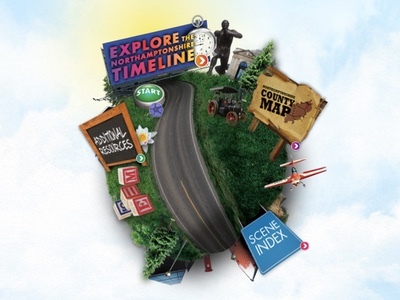 Designed for families and groups, the game encourages players to explore the museum and engage with it’s exhibits through a range of social challenges and activities. 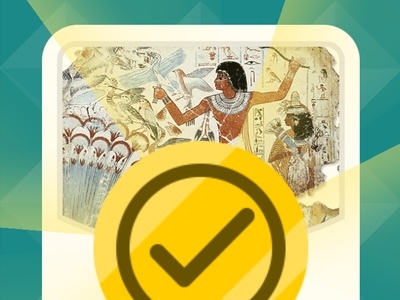 The game makes extensive use of Unity 5's UI framework to create screen layouts that are flexible and localisation ready, with all text and images loaded dynamically from the British Museum's content management system. The game can be played by renting one of the specially configured Android handsets while visiting the Museum. 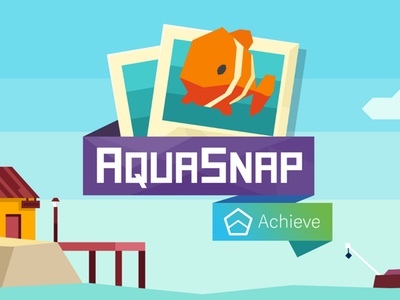 AquaSnap 2 is a multi-platform game that aims to improve cognitive ability, through a range of memory and reaction based mini-games. 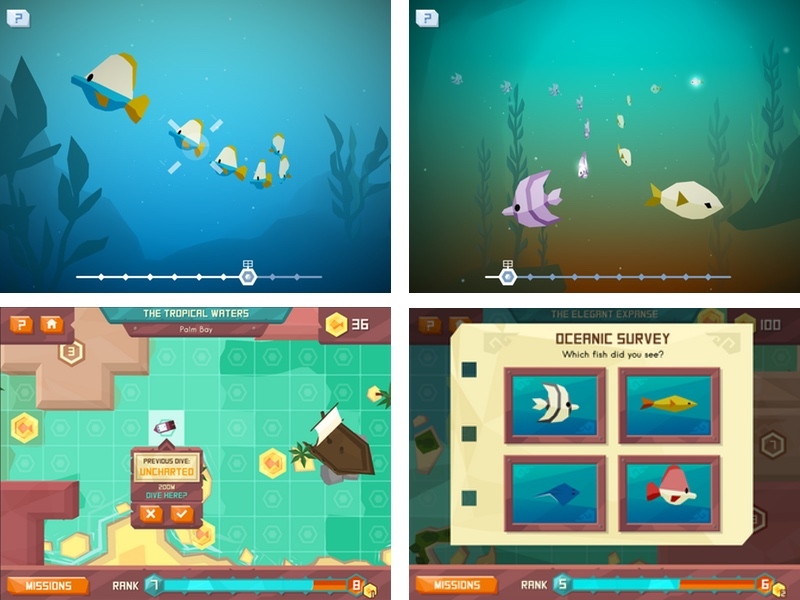 The game features a fun and friendly deep sea diving theme with a focus on sea life photography. I worked as part of the team tasked with enhancing a pre-existing version of the game, ready for it's first consumer-facing release. The process involved an extensive overhaul of the game's existing systems, replacing all of the game's UI, rewriting editor tools, improving the UX and introducing a new 3D world map, mission system, additional mini-games and a much improved tutorial. The Multiplayer Client Library (MCL) provides a standardised framework for implementing networked multiplayer modes across Amplify's suite of award winning educational games. 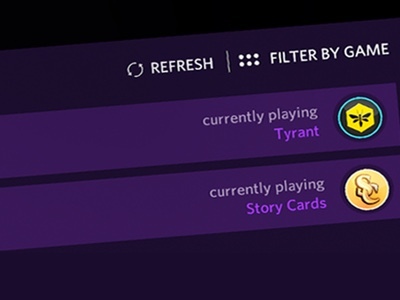 The MCL enables players to exchange invites between any supported game installed on their tablet and automatically switches all players into the correct game when an invite is accepted. It also provides developers with a clear API and streamlined setup process that hides much of the complexity of multiplayer programming. I led planning and development of the library and also wrote extensive documentation that included developer guides, API docs and an FAQ. Originally built around SmartFox multiplayer server, I used the abstractor pattern to ensure that a change of server-side technology would not require much refactoring for projects that use the MCL. The library has since been ported to Game Center, with very few API changes required. Mlob Rule is a strategic turn-based battle game, with a focus on helping students practice and master fraction-based mathematics. 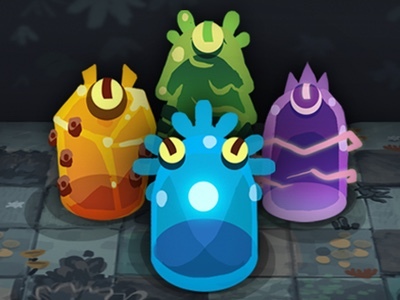 Built in Unity, with controls tailored specifically for touch screens, the game features a single player campaign against a series of AI opponents and a choice of multiplayer options, allowing players to battle online or head-to-head on a shared device. I was responsible for development of the core gameplay logic, multiplayer net-code and AI opponent behaviour. All game logic was developed to be fully deterministic, which greatly improved productivity on the project by reducing multiplayer net-code complexity and enabling automated testing of specific gameplay scenarios. Kid Claw in Dino World is a retro style platform game, created for Game Boy Jam 3, during the summer of 2014. 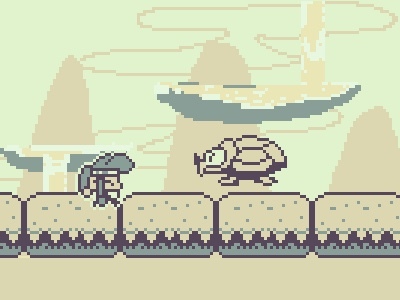 Following the rules of the jam, the game was created in a single week, using pixel art with a palette of only 4 colours, a screen resolution of 160x144 pixels and 8-bit style music and sound fx. The core gameplay was inspired by the NES classic Bionic Commando, as well as modern games such as Hook Worlds on iOS. I collaborated with Chris Cox (art) and Fiona Byrne (music) on the game, working in my spare time on gameplay and tools programming using C# and Unity. It was great fun! 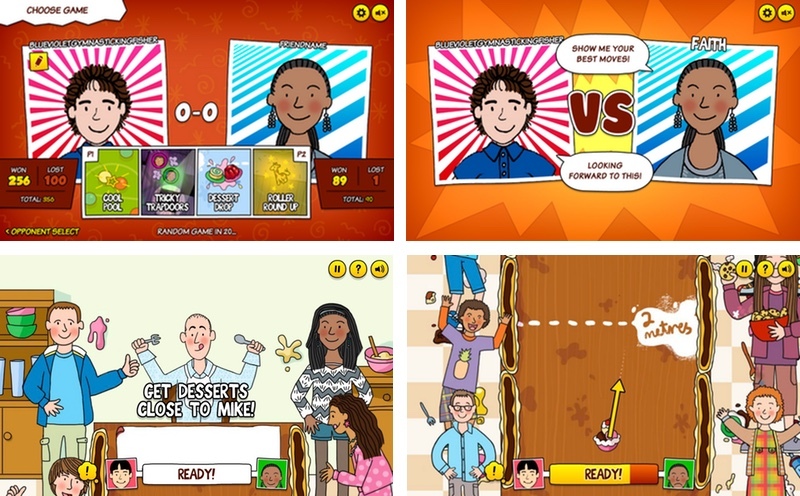 Dessert Drop is one of four games in The Dumping Ground Game, a mini-game collection created to promote the first season of The Dumping Ground, a spin-off of the popular Tracy Beaker TV series. All four games in the collection feature online multiplayer, built around the BBC’s Games Grid framework. 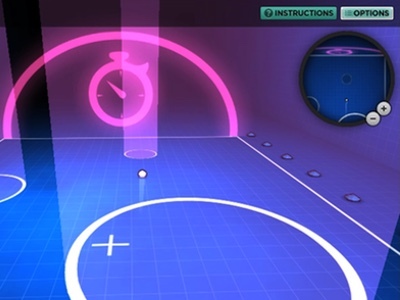 I assisted with development on the project by programming Dessert Drop, a fun re-interpretation of Curling, in which players slide a variety of tasty desserts down a long kitchen table towards a target. The whole project was well received, with over 1 million unique plays and a nomination for the Children's category of the 2013 Broadcast Awards. 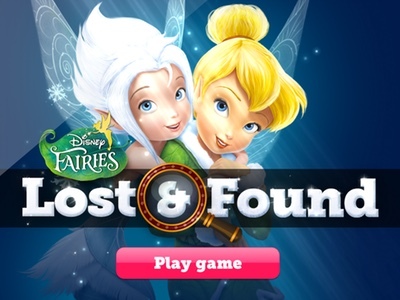 Disney Fairies: Lost & Found is a hidden object game that was released alongside the movie TinkerBell and the Secret of the Wings, during the Christmas 2012 holidays. 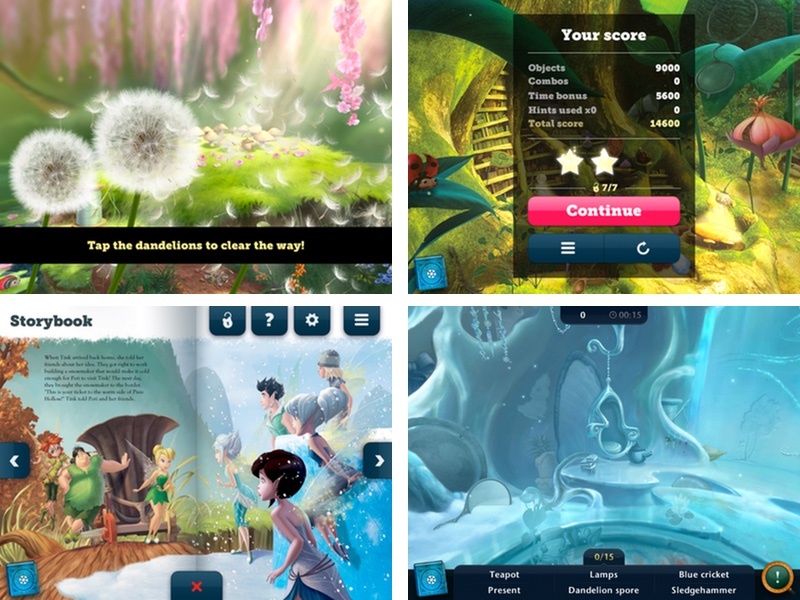 The game features a range of highly replayable levels, set within unique pseudo-3D environments made using art from the world of Disney Fairies. I developed the main gameplay logic, menu systems, custom level editor tools and native plugins for the game. Structurally, the project required the team to maintain many work streams, as there were premium and ‘lite’ versions of the game, as well as content updates that added extra levels to the game. 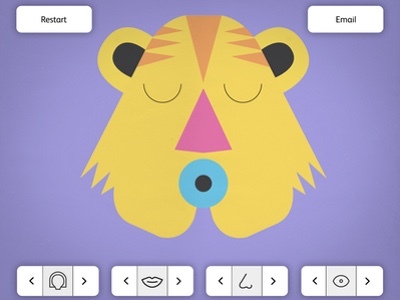 On release, the game was a major success, becoming the #1 Kids Game in the App Store charts during December 2012. 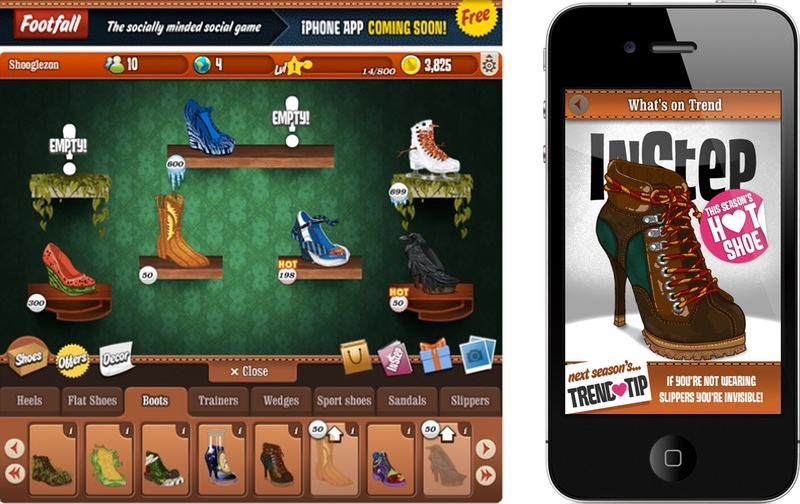 Footfall is a Facebook game and iOS App designed to encourage teens to think about financial literacy, entrepreneurship and ethics, by putting them in charge of an independent shoe shop, making serious business decisions on a daily basis. 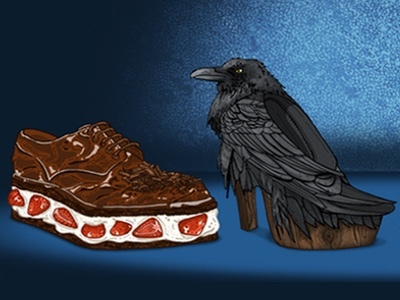 The game features over 100 fantastical shoe designs and encourages players to connect and share their progress with their friends. I was one of two developers on the project, and was mainly responsible for UI and mini-game programming, in addition to full development of the iOS App, which helps players keep an eye on their shop, while away from their computer. The game was nominated in the Social Game category of the 2012 TIGA Awards. 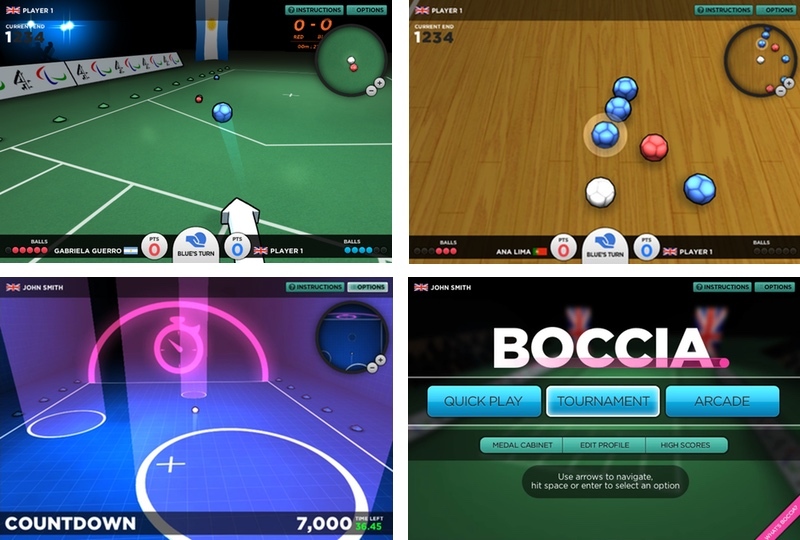 Boccia is a web game created to help showcase Paralympic sports, ahead of Channel 4’s coverage of the 2012 Paralympics. The game features two modes: a simulation mode where players advance through a series of tournament stages, and a faster-paced arcade mode where players compete for high scores against the clock. As Lead Developer on the project, I worked on all technical areas of the game, including gameplay programming, UI and menu systems, unlockable achievements and opponent AI. The game was very well received, gaining nominations for the Unity (2011) and FITC (2012) awards following it's release. 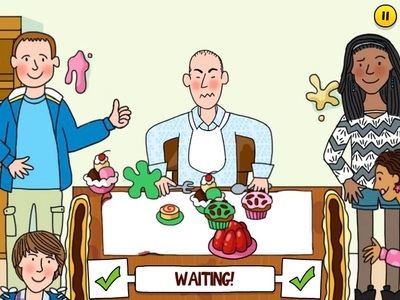 High Tea is a web game created for the Wellcome Collection’s popular High Society exhibition. 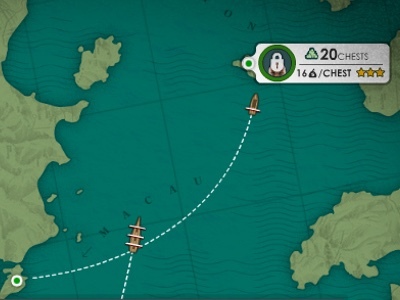 The game takes place during the events that led to the 1838 Opium War between Britain and China, and aims to shine a light on this shady period of British imperial history. 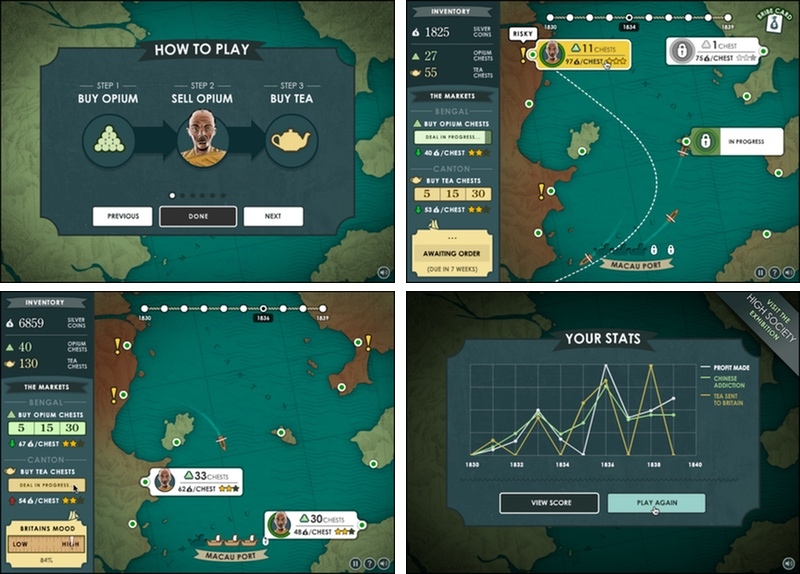 Gameplay centres around a fast-paced 'plate-spinning' trading mechanic, with players tasked with buying enough tea from China to meet British demand, while also making as much profit as possible through the sale of Opium. I worked on all technical aspects of the game and also contributed to the game's tricky gameplay balancing. The game was a considerable hit, with over 1 million plays during it's launch week. It was also nominated for the SXSW (2012) and BIMA (2011) awards. 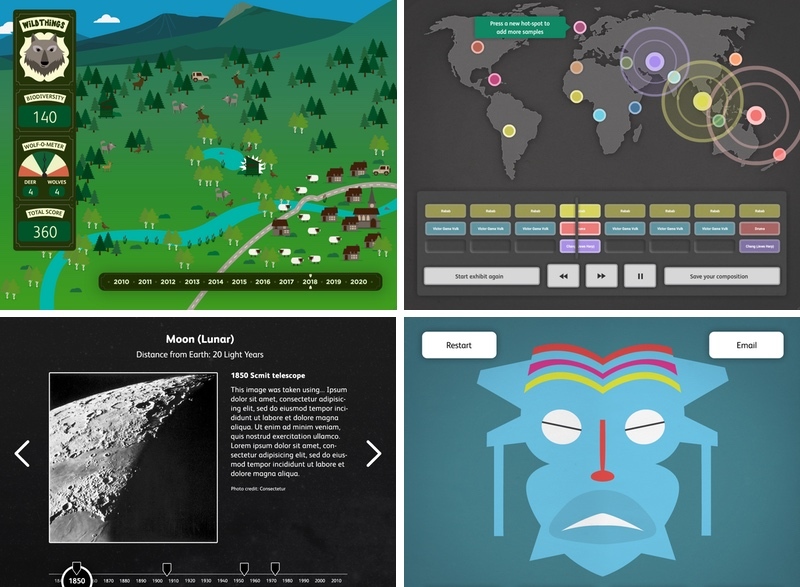 Created for the Nation Museum of Scotland’s redeveloped Royal Museum building, this series of unique interactive exhibits aims to compliment the wide range of items in their collection. As one of three developers on the project, I worked on various features of all five of the exhibits, using Flash and Adobe AIR to create experiences that used dual screens, touch screens and custom controllers. 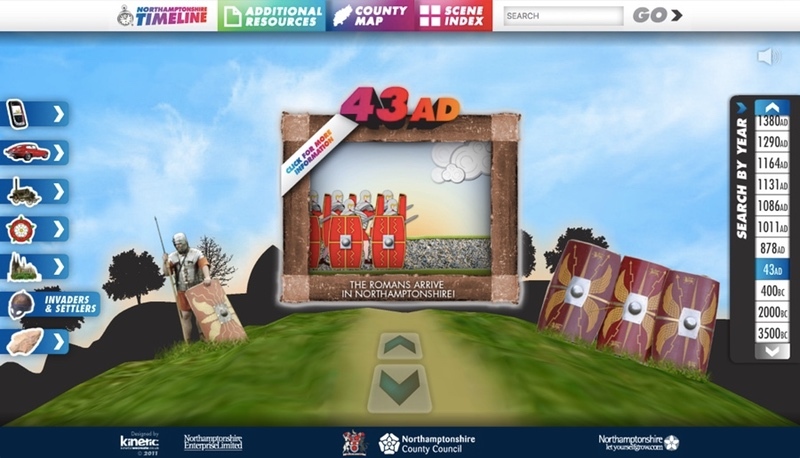 The Northamptonshire Timeline is a website that showcases the history and heritage of Northamptonshire using an innovative 3D navigation system. The site was created using PaperVision3D, a cutting edge (for the time) open source 3D engine for Adobe Flash. As Lead Developer on the project, my role was varied, covering everything from ActionScript, PHP and MySQL development to planning and project management duties. The site was accessible and fully search engine optimised, allowing for deep linking to any point on the timeline while also providing all content in HTML format. 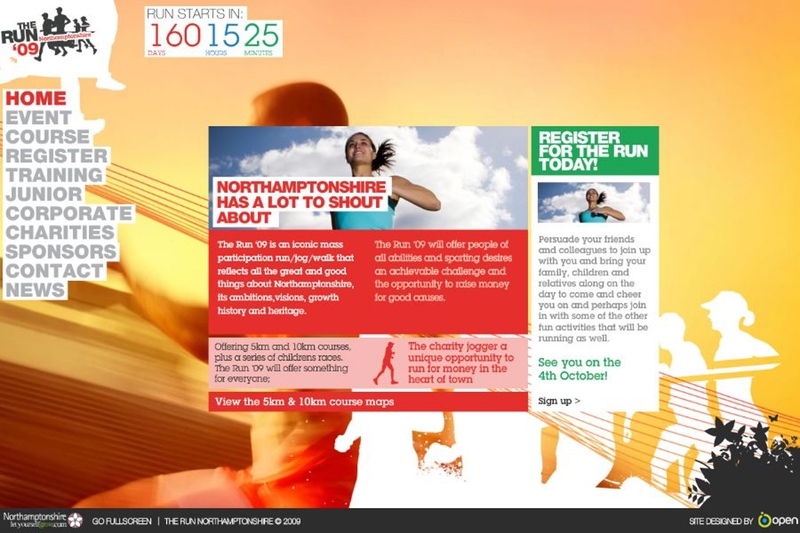 The Run was a popular charity half marathon held yearly in central Northampton during 2009, '10 and '11. 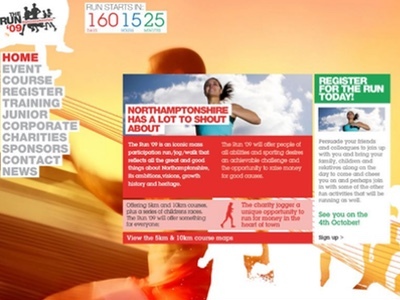 I was Lead Developer on the team that created the website to promote the event on behalf of Northamptonshire County Council. 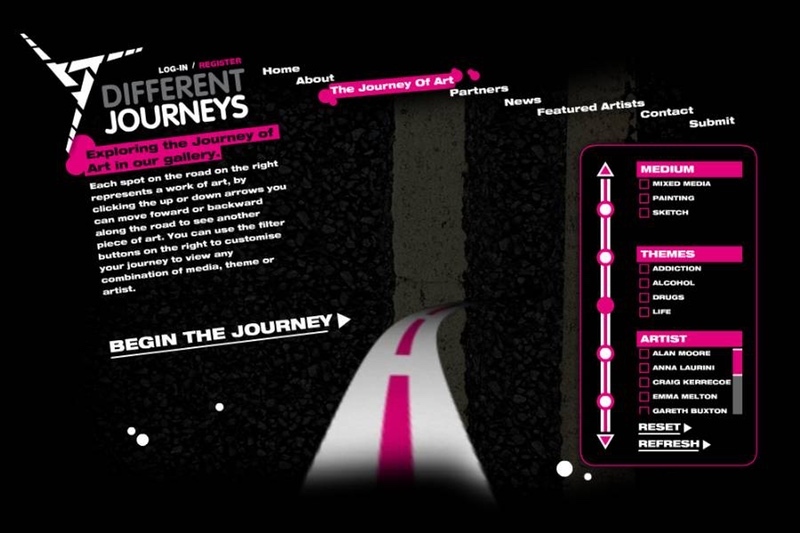 The website was a slick and energetic Flash experience, which really brought the event's iconic branding to life. The site was fully search engine optimised, offering deep linking and a HTML alternative for all of it's content. 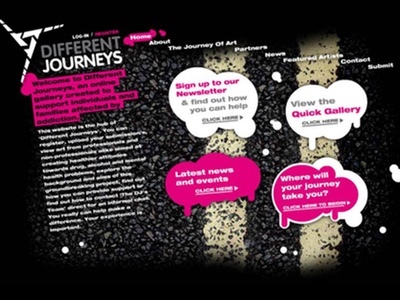 Different Journeys was an arts project run jointly by the University of Northampton and CAN, a charitable agency providing drug, alcohol and homelessness services within Northamptonshire. 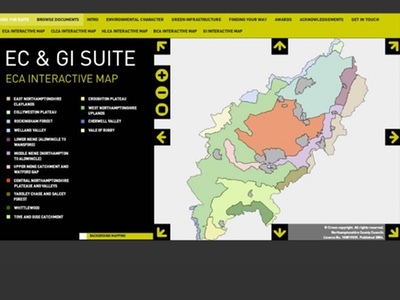 This website and desktop application was created for River Nene Regional Parks, an organisation dedicated to the development of green infrastructure projects in Northamptonshire. 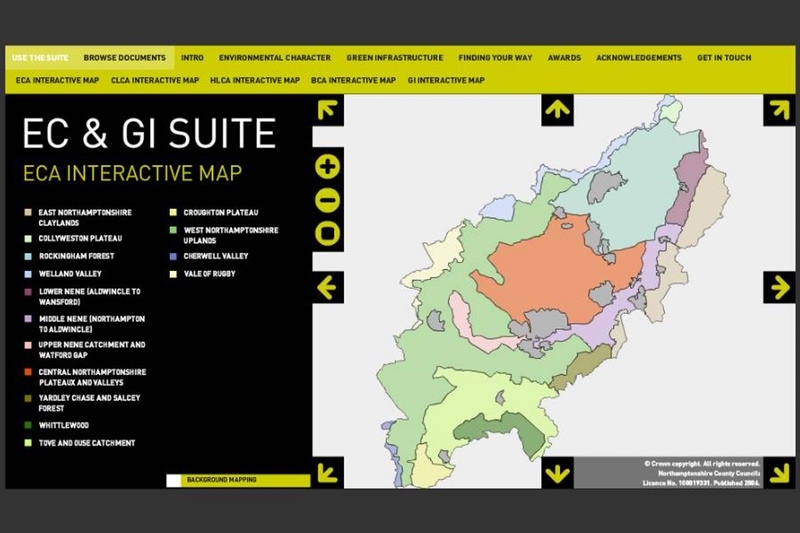 The web application allows users to explore detailed maps of the RNRP’s green spaces in fine detail, providing links from specific map areas directly to their associated content within hundreds of pages of reports and documentation. I was responsible for all Flash development on the project and also created several downloadable post-launch updates for it. The project was very well received and went on to win the E-Government category in the Royal Town Planning Institute Awards 2007.